I happen to love it â but then again sometimes I am bothered by the OTT ness of it all.Â Edgy, kooky and colourful is fabulous but then itâs knowing when to stop and edit that is the key.Â I think the thing to go for is always mix, never have anything that is purely one look (too boring) or from one source (beyond dull). This way you will create a sense of adventure and drama. When I walk into a space I want to be intrigued, my eyes to be dazzled and I want to feel emotion.Â Itâs easy to do just start thinking like a maximalist â layer, play daringly with colour and scale in and no time you will have a fabulous concoction. Oh and donât be put off if friends and family donât get it. I was ribbed beyond comprehension over Christmas by certain members of my extended family who found my madcap mix of stuff beyond conception. Would I rather live in a beige sea of graciousness â not on your Nelly! 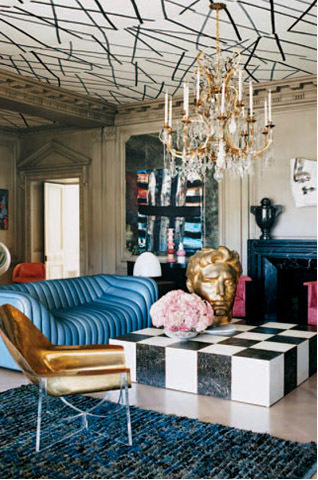 One of Ms Wearstler’s interiors – I love everything apart from the ceiling which to me is just a little too crazy.